Tokyo, November 27, 2018 --- NTT DOCOMO INC. and Rohde & Schwarz have joined forces to set up the world's first ultra-wideband channel sounder for mobile communications exceeding 100 GHz. They conducted radio wave propagation experiments at frequencies up to 150 GHz. The frequency bands from 100 GHz to 300 GHz are expected to enable further high-speed and large-capacity communications for the next generation beyond 5G. 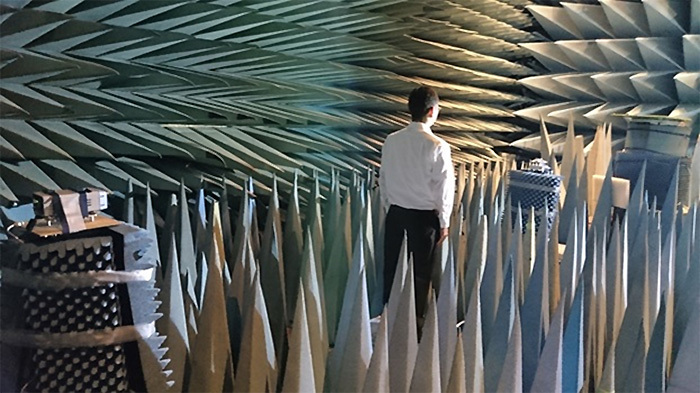 In the experiments, the two companies measured and analyzed the effects of radio wave propagation characteristics and shielding effects in the mmWave range. As a result, they pioneered new frequency bands and contributed to the realization of terabit-class mobile communication systems. In the 100 GHz to 300 GHz frequency bands, wider bandwidths are available than in those used for 5G. However, these higher mmWave frequency bands are strongly affected by persons, vehicles, trees and environmental conditions like rain. It is therefore necessary to research the influence of such objects on the radio wave propagation characteristics. Using test and measurement equipment from Rohde & Schwarz, DOCOMO has developed a novel ultra-wideband mmWave band channel sounder to measure radio wave propagation characteristics necessary for evaluating mmWave mobile communication systems exceeding 100 GHz. The measurement parameters include the propagation loss (degree of attenuation of radio waves), power delay profile (arrival time of radio waves) and angular profile (indicator of spread of radio wave arrival). In the test system the R&S SMW200A signal generator together with the R&S SMZ frequency multiplier generate the mmWave bands, while the R&S FSW85 signal and spectrum analyzer equipped with the R&S FS-Z170 analyze it with a scalable wide analysis bandwidth of up to 2 GHz. The setup offers a highly convenient user interface with a high-resolution multi-touch display directly displaying the radio wave propagation characteristics in real-time. In this experiment, this test system was placed in an anechoic chamber. 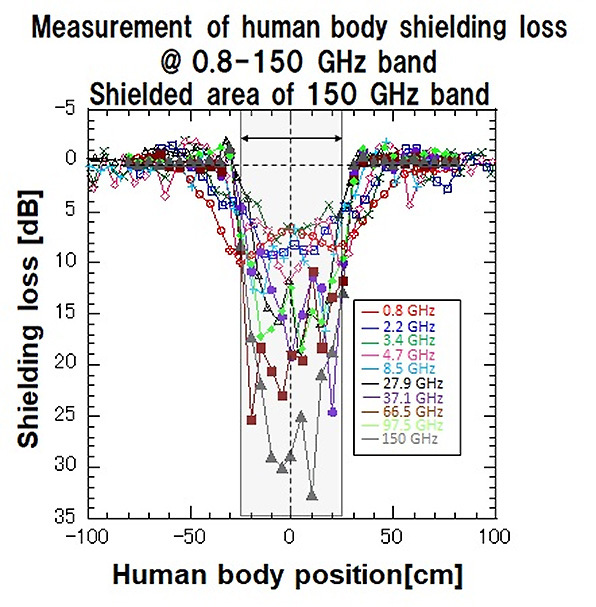 DOCOMO and Rohde & Schwarz confirmed that they can measure and analyze the shielding effect of the human body, applying signals up to 150 GHz in all common 5G frequency bands currently in use or under consideration. Through their close collaboration, DOCOMO and Rohde & Schwarz show their commitment to contributing to the development of next-generation mobile communication systems beyond 5G worldwide. Fig. 2 Experimental results of the influence of the human body at various frequencies.